MEP Michael Cramer sits in the transport and tourism committee in the European Parliament. 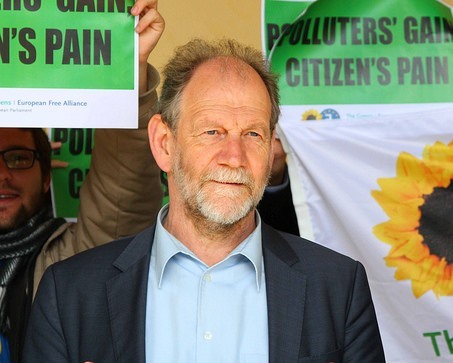 Unfair competition between transport sectors is one of the biggest obstacles in reducing polluting emissions in Europe, says Michael Cramer MEP. Communities should also change their mobility patterns in order to safeguard the environment. Michael Cramer, a Green/EFA MEP from Germany, is the chair of the Transport and Tourism Committee in the European Parliament. He spoke to EURACTIV’s Ecaterina Casinge. You argue that without an overhaul of its transport policy, the EU will never be able to fight climate change meaningfully. What exactly are you referring to? The transport sector is responsible for 24% of all the CO2 emissions in the EU. The road sector alone accounts for 72% of transport emissions in Europe. What is worse, while emissions from other sectors (i.e. the industry) went down since 1990 by 32%, those from the transport sector have increased with about 28%. The transport sector is nullifying all the efforts we have achieved with billions of Euros from our tax payers. In terms of concrete examples, by 2050, 85% of the population will live in cities. Therefore, we will not be able to stop climate change if we do not alter our mobility patterns. Today, 90% of all driving distance in cities account for less than 6km. Instead of using a car on such a short distance, people should change to a bus, tram, train, bicycle or travel by foot to cut down their emissions. This does not apply, however, to rural areas. Sometimes it is more environmentally friendly to use a car instead of a bus that would run with only 3 persons. But we still need to change the cities’ behaviour. For example, Copenhagen has seen a 300% increase in cycling in the past 20 years. More than half of Copenhagen’s population is going to work or to school by bike. If someone would have said this two decades ago, no one would have believed it. Same thing happened in Berlin where bicycle commuters increased from 6% up to15% within the last 12 years. I [haven’t had] a car since 1979. I am not an exotic person, because every other household in Berlin doesn’t owe a car, and we are all mobile. This is a future we need to aim at. In Brussels, they built tunnels in the seventies to fight against traffic jams. And the reality in the morning is more traffic jams. The aim should have been not to enlarge the roads, but to reduce the transport to avoid traffic jams. The mayor of Munich, Hans-Jochen Vogel (a Social Democrat) has pointed out already in 1972 that, “the car is murdering our cities, the one who sows roads reaps traffic”. Don’t you expect resistance from the automobile industry, as this will affect not only sales, but also the jobs of many people? The car industry is the biggest job killer during the last 20-30 years due to automatisation, but nobody talks about it. Cars will still be in demand, but not forever and also not as many as today. Only those automobile companies that will understand the need to diversify manufacturing capabilities will be successful in the future. One good example is Daimler-Benz’ strategy from 1989. The then-CEO Edzard Reuter changed the car factory into a mobility undertaking by producing cars, trucks, trains, trams and even bicycles. A great idea, because the jobs they lost in car production, they gained in the other production lines. Unfortunately, his successor has sold all the parts not related to car production, and now the company is back [being] dependent on cars even though there is a renaissance of trams, trains and bicycles all over the world. The car industry as such will decrease. The railway sector is the least harmonised transport policy area in the EU. Why is it lagging behind? Railway undertakings are the last nationalistic bodies in Europe. The European Parliament wanted to create an interconnected network, but the Commission, together with the member states, failed to achieve it. Today, the railway network is a patchwork with gaps exactly where the borders lie. The member states fund their national projects with the EU money, but do not care about the European added value. This could only change when the Commission concentrates on closing those gaps, which are the result of the past wars and the Cold War divisions. The transport sector’s biggest problem is unfair competition. For example, all railway tracks charge trains a toll per kilometre, whereas 99.1% of European roads could be used for free. If the situation does not change, the railway sector will never get a chance to become competitive and prioritized over a car. We need fair competition for all sectors where either all or nobody pays. If we compare the railway situation with aviation, the airlines get every year €30 billion from the European tax payers because they don’t pay a kerosene tax or a value added tax on international flights. All the railway passengers, however, have to pay these taxes. Apart from being unfair, it is also not socially [correct] or environmentally friendly. How do you find the right balance as a legislator between ensuring competitiveness of the transport sector, and protecting the climate at the same time? We need to stop the subsidies for climate killers. Either everybody is paying tolls, a value added tax or a mineral tax, or nobody. In Germany, the price for a train ticket has increased by 15 times compared to the price for mineral tax, which hasn’t changed in the last decade. The same thing happened for a parking ticket. Train passengers are penalised with €60 for missing a ticket, when a parking fine costs only €10. We have to subsidise environmentally-friendly modes of transport, not the climate killers. What are you expecting from the new Transport Commissioner for this mandate, and which are the priority areas you think the Commission should pay attention to? Priority should be given to the 4th Railway Package, the internalisation of external costs, fair competition, and the implementation of the user pays principle. In theory, everyone, including all governments, are in favour [of these initiatives] – they [start to] object when those principles are put into practice. In general, the transport sector needs more politics than money to make sure we close the current legislative gaps.